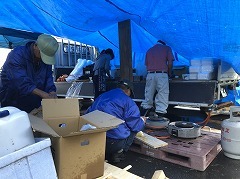 Although there were only about 50 people evacuating at the Atsuma Sports Center as many had already returned to their homes, running water was still not available throughout the town, so it was necessary to also provide food for those living in the vicinity. According to the 11am report on 9th September from the chief of the Crisis Management Section of the Hokkaido General Affairs Department, 37 deaths have now been reported, and there are 5,788 people living among 178 evacuation centers. Although power has returned to many of the affected areas, running water is still unavailable.